While Los Angeles’ Vietnamese restaurants have somewhat lost their luster for me, Little Saigon’s novelty is still intact. On our second trip to the motherland (V 2.0), we dropped into Brodard Restaurant in Garden Grove. Brodard was unbelievably bumpin’ this Sunday night. Every seat in the house was occupied, while the wait list seemed to go on and on. Not to mention that the take-out counter was doing some brisk business. After waiting for thirty minutes, The Astronomer and I scored a table fit for four. It was finally time to taste Brodard’s famous nem nuong cuon. 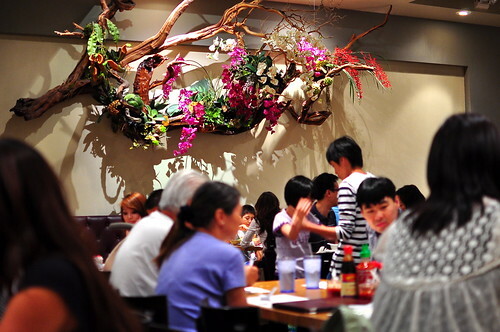 Brodard’s decor strikes a balance between modern and cheesy, like only a Vietnamese-American restaurant can. 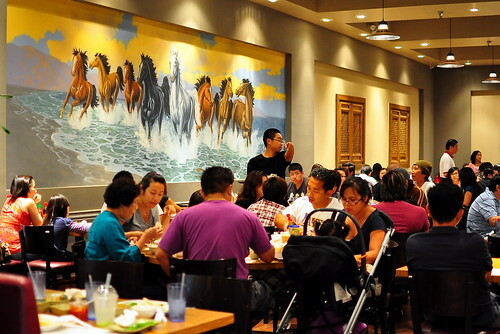 I liked the modern furnishings and clean lines, but couldn’t embrace the mural of stallions galloping along the shore. The floral arrangement protruding from the opposite wall was awesomely tacky as well. Sadly, there was no sign of a Vietnam-shaped clock, my favorite dining room accent of all. 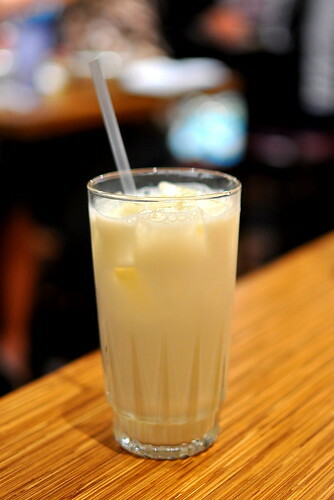 After spending two hours in traffic, I was downright parched and killed my slightly sweetened soy milk (sua dau nanh) in thirty seconds flat. It really hit the spot. Soon after, our dishes started coming out of the kitchen. The Astronomer ordered the goi du du kho bo, gan chay ($5.75), one of his all-time favorite salads. It consisted of shredded green papaya topped with house made beef jerky and smoked pork liver jerky. Vietnamese coriander (rau ram), crushed peanuts, and a spicy dressing added the finishing touches. The beef jerky, dressing, and papaya were delightfully fresh and familiarly flavored. The pork liver jerky tasted quite intense and proved to be an interesting addition to the salad. 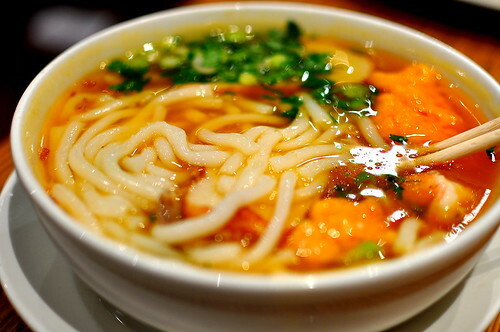 I ordered a bowl of banh canh tom cua ($8.50) because I was in a noodle slurping mood. My thick rice noodles were adorned with plenty of shrimp, fish cakes, slices of pork, fresh crab meat, and seafood meatballs. They were garnished with chopped green onions and cilantro. The broth was seasoned just right and tasty till the last drop. I never loved banh canh very much as a kid, but the slippery noodles and gelatinous soup have grown on me over the past few years. All that was missing was a porky trotter for me to naw on. The star of the Brodard show was the last to arrive at the table—nem nuong cuon ($6). 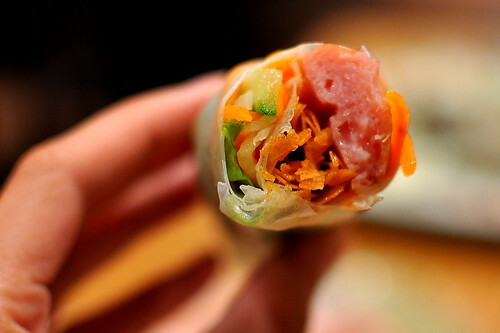 Each roll was tightly wrapped and filled with nem nuong (grilled pork forcemeat), lettuce, cucumber, carrot, daikon, and mint. I loved how taut the rice paper felt, like a freshly Botoxed spring roll. All of the excitement surrounding Bordard’s nem nuong cuon seems to center around the satay-style peanut dipping sauce with crumbles of ground pork served with it. I found the sauce too sweet, and its consistency goopy and off-putting. What I liked best about the spring rolls were the bits of fried egg roll wrappers in the center. The crunch was unexpected and satisfying. I’ve never experienced anything like it in Vietnamese cuisine. The Astronomer and I stumbled out of Brodard stuffed to the brim and with leftovers in hand. We hope to return again the next time traffic is on our side. So glad you finally made it to Brodard, Cathy! I’ve been venturing there for years. 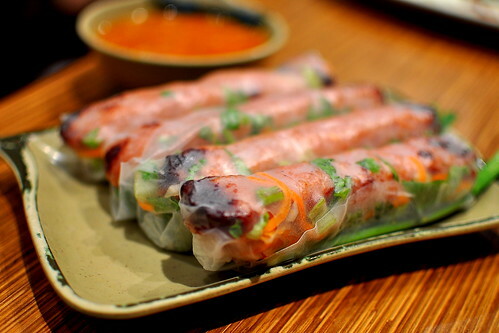 I recently took a couple of friends who had never been and they wanted more of the nem nuong cuon to go! I agree, though, that the decor is so cheesy tacky…LOL! I don’t venture to Westminster that often but this was the one restaurant that I did go to and it was completely unexpected how much we loved it. The name threw us off. How did they come up with it? So miss Brodard’s nem nuong cung! It’s been about 5yrs since I had my last one… thanks for bringing back happy food memories! Beamblossom – I think that Brodard is of French origin. 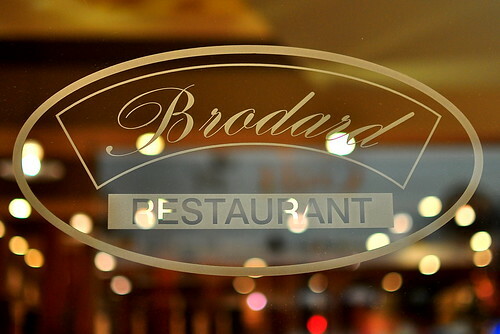 There is a French bakery in Saigon named Brodard. oh my goodness i love brodard! 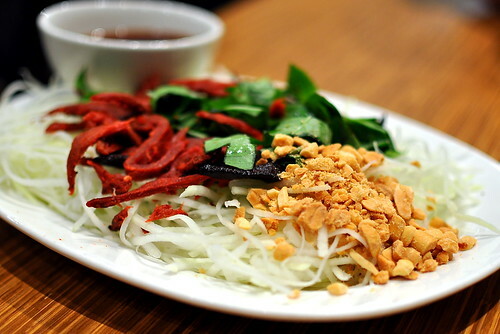 !when my mom took me i thought she was over reacting about the nem nuong but oh my, when i took a bite, i thought i was going to die! !it was so good! secret to the brodard dipping sacue is actually crab roe which makes it bright orange and a mix of meat juices and what not. the best way to really eat the sacue is to spoon it on top of the goi cuon. If you mix the sauce too much with the roll then the sauce will separate and become liquid-y on top. I remember Brodard nem nuong’s crunchy egg roll wrapper used to be filled with some shrimp paste instead of a piece of green onion and that the orange sauce used to contain actual crab meat. But then again, that was probably 10 years ago. Although Brodard’s bustling environment gives it a more authentic Saigon street cafe feel, I prefer the sister restaurant Brodard Chateau. Same food, better prepared, no bus carts filled with dirty dishes clattering by and no cheesy decor. whenever i am in the LA area, i always always always find myself here (as well as at Chateau). my stepmother learned how to make nem nuong & sauce (& a bunch of other foods) from the owners when they first left Vietnam & stayed with us when we were stationed in Manila. 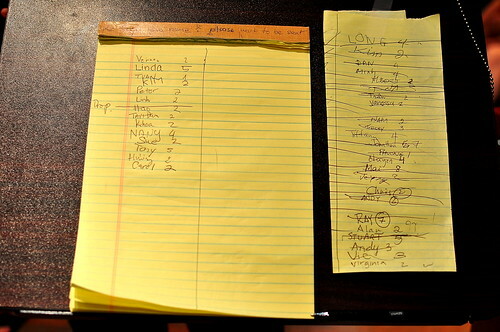 i was the scrawny kid in the kitchen, sneaking food while they had their cooking lessons. it’s funny that back then i was more interested in eating what they made & now i’m about learning how to make it all. You finally went! Yay! 🙂 Though I am a fan of the sauce, but the nem nuong cuon never disappoints!